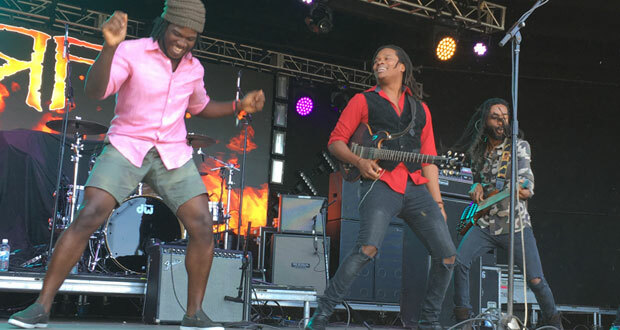 Q: [Raging Fyah] has a huge following worldwide. Another place where anyone can see this is in Africa. They adore you there. The idea of Raging Fyah singing your song “Africa” from off of the “Destiny” album actually in Africa [brings] goosebumps. I mean (singing) “what if our destiny is that we’ll all be free, when we all meet at our homeland [in Africa]”? Kumar, you were recently on the radio with “Mister Parties” [a radio DJ] in Kampala, Uganda, on 97.7, and he was basically pleading for Raging Fyah to come to Africa. In fact, he just rated [Raging Fyah’s new song] “Rebel” the number one track on his “ReggaeHitsVille Top 10.” Are there any obstacles that prevent you from performing in Africa? Kumar: No. Not right now. We’re just waiting on the phone calls to come in the right way. Q: [You’re] waiting for it to be setup. Because you would jump to go perform there if you could? Q: Before you signed [a multi-album deal] with VP Records, you produced your own music initially. And I know that one of the big reasons you signed with them was [for] them to help you grow your market [share] on the West Coast [of the United States]. You must be satisfied because it seems to be working as you said – they’ve done that. But: do you think that despite all the success you’ve had with VP, that someday you may go back to producing your own music? Or are the benefits of being with a big company like VP too [overwhelming]? Kumar: Well, producing the music is one thing. Because we still produce our own music. But the distribution is what you’re referring to. VP helps us to get the brand out there. Yeah, eventually we’re going to become, maybe, an independent label again in the future. But for now, I think it’s good to collaborate, and, you know, share what we have going on. Kumar: No, because the course didn’t exist when we were there. It’s just now that we’re traveling and giving information to the college [telling them that], hey, you need to get this information in the system. It’s now happening. Q: So through Raging Fyah, the band is now able to provide more of that kind of knowledge to the students coming through? Q: About all this stuff? Q: Now I want to end by asking a few questions about Rastafari because this is such a [heavy] focus on all of your albums. Would you agree that that is something that factors very heavily in your music? Kumar: Yeah. As usual, I mean the teaching of Rastafari – we’re born in Jamaica, you know? It’s our third eye. That’s it. Q: In a 2015 book called “The Half That’s Never Been Told (The Real-Life Reggae Adventures of Dr. Dread)” by Gary Himelfarb, a.k.a. “Dr. Dread,” the founder of “RAS Records,” which has produced a lot of [quality] reggae music, he [wrote] he has a very close relationship with Haile Selassie I. He [wrote] that he actually once saw H.I.M., or had a vision of H.I.M., walking down Trafalgar Road, which I believe is in Kingston. And he [wrote] that no [one] can say that he doesn’t have a relationship with Haile Selassie I just because he’s a white man and doesn’t have dreadlocks. Nobody! And, in fact, he [writes] that he does have a relationship with His Majesty, and gives praises [to him] every day. Do you accept that? Can white men and white women have a relationship with Haile Selassie I? Kumar: That question I can’t answer “yes” or “no”; I can just speak for myself. I mean the relationship you have with anything you believe in depends on your own self, you know? You could have a relationship with a cat, if you really believe. Q: – about whether or not white people can have a relationship with Haile Selassie I? Kumar: Yeah, that’s what I’m saying. You have some people, [we] call them “religious police,” you know? Nobody owns any faith or any culture. Your culture can shape your worldview. And so if you see Rastafari as a light, then go right ahead. He’s not going to deny you. Q: Isn’t there an analogy to be made to the popular debate about white people who are appropriating reggae music and making money off of it? If you come at it with a pure heart, just like if you come to Rastafari with a pure heart and intention, and you believe in it, and you show respect for the culture, and to the roots of it, isn’t [that what counts]? Kumar: Yeah. It’s like Taco Bell and Mexico. Music is just culture. Culture is – if you can appropriate it properly, and give respect to it, then it’s for everybody. It shouldn’t become something where we’re fighting: “Oh, you’re white, you can’t play reggae.” Well, “you’re black, you shouldn’t be eating Mexican food.” Or, “you’re white, you shouldn’t be eating pasta.” You know what I mean? Kumar: It’s just the world. It’s just so much fight. This against that. Then that against this. Let’s just cut it all out. Q: Cut all the fussing and fighting out?